Empathetic and self-searching...a highly witty, deeply humane look at people who may be too conscious for their own good, people who think and feel too much ever to be truly happy. 119 min. A24 Films. Director: Mike Mills. Cast: Annette Bening, Elle Fanning, Greta Gerwig, Lucas Jade Zumann, Billy Crudup. At one point in 20th Century Women, writer-director Mike Mills’ semi-autobiographical comedy-drama, one character asks another, “How did you get to be this person that you are?” It’s that loving curiosity that emblematizes Mills’ work, which is both empathetic and self-searching. With his previous film, Beginners, Mills memorialized his father in a story of late-in-life coming out (Ewan McGregor and Christopher Plummer played the surrogates for Mills and his dad). Now, Mills turns his attention to his formative year and the women in his life, especially his mother. The story takes place “at a turning point in our history,” as Jimmy Carter puts it in his “malaise” or “crisis of confidence” speech. In 1979, Mills was becoming a man not long after America, too, lost its innocence, post-Vietnam, post-Watergate, and about to welcome Reagan as the man with the answers for the go-go ‘80s. Annette Bening plays single mother Dorothea Fields. “Don’t worry about her,” her fourteen-year-old son Jamie (newcomer Lucas Jade Zumann) clarifies. “She’s from the Depression.” Though partly Jamie’s coming-of-age story, 20th Century Women primarily celebrates three generations of feminists in Dorothea and the family friends—Greta Gerwig’s free-spirited boarder Abbie and Elle Fanning’s teen neighbor Julie—that Dorothea enlists to help raise her son. Mostly, though, 20th Century Women is a highly witty, deeply humane look at people who may be too conscious for their own good, people who think and feel too much ever to be truly happy. It’s a film crammed with true observations about life’s contradictions and frustrations and fleeting joys, about the cruelties of even the most loving relationships and the deep need to understand and protect the people we love. Above all, Bening pumps the blood of the film with yet another flawless performance. Just to watch her listen, fully present and with amazing focus, amounts to a master class in acting. Indeed, all the actors in the film are as good as they’e ever been (Billy Crudup plays the lovably fumbling romantic in orbit around the Fields home). Mills’ thoughtful, mature filmmaking and this beautifully humane, searching story of differing generational perspectives in conflict and mutual support give the actors an ideal circumstance to ply their wares. For all of life’s disapointments, the wistful 20th Century Women feels like a smile and a hug. Mills invites us to relate to good people making mistakes, rolling with the punches, and sometimes getting it right. That’s how, one hopes, you get to be the person that you are. 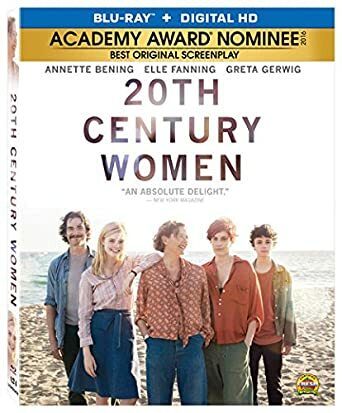 Lionsgate sends 20th Century Women home in a fine Blu-ray + Digital HD special edition with great A/V and a few quality extras. After watching the film first in 4K projection and then at home on an awards-screener DVD, I can tell you that the hi-def Blu-ray presentation greatly skews to the former in its presentation. The image is entirely vivid, sharp in detail, rich in color and texture, and perfectly calibrated in black level and contrast. The image never takes on a video sheen, though, but rather retains a filmic feel with a striking sense of dimensionality and depth, even in low-lit interiors. The lossless DTS-HD Master Audio 5.1 mix mostly powers up for the circa-1979 source cues, but it's able in all respects, with clear, well-prioritized dialogue and subtle ambience provided by rear channels. Best of bonus features goes to the in-depth audio commentary with director Mike Mills, who's primed to discuss the writing of the film, its basis in his own experiences, the era the film depicts, the production in its particulars, and his work with the various actors. The set also includes two nicely produced (if a bit short) featurettes. The first, "Making 20th Century Women" (9:31, HD), functions as a catch-all making-of, with set footage, film clips, and interview snippets with director Mike Mills, Annette Bening, Greta Gerwig, Elle Fanning, Billy Crudup, Lucas Jade Zumann, producer Youree Henley, production designer Chris Jones, costume designer Jennifer Johnson, and cinematographer Sean Porter. "20th Century Cast" (10:49, HD) has a similar appearance, with Mills, Bening, Gerwig, Zumann, and Crudup discussing their characters and their collaborative work together. All site content © 2000-2019 Peter Canavese. Page generated at 04/17/2019 05:11:57PM.